How do I buy a Proper Cloth gift certificate? 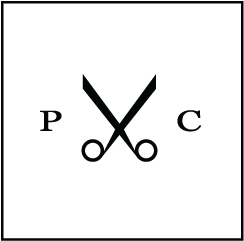 Proper Cloth gift certificates can be purchased online here. Physical gift boxes can also be purchased online and shipped to the recipient. 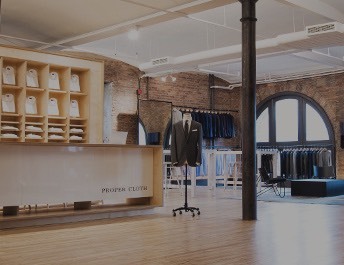 Customers in New York City can purchase gift boxes in-person at the Proper Cloth showroom. Online gift certificates can be sent immediately (or at a specified date in the future) via email. How do I send an email gift certificate at a later date? After entering the name, email address, and personal message for the recipient, click ‘Chose a Date’ (rather than the default ‘Send it Now’) and select the preferred delivery date. How do I redeem a Proper Cloth gift certificate? 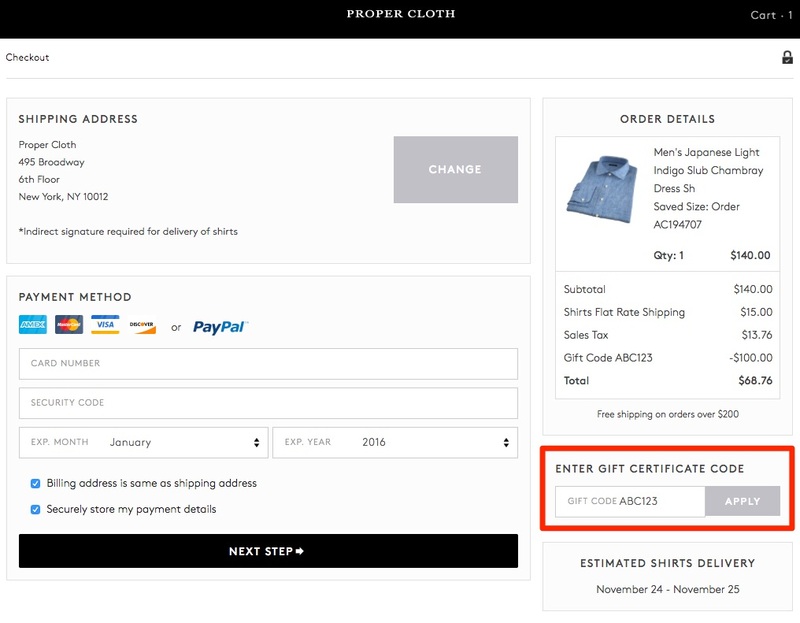 At checkout, you’ll find the Enter Gift Certificate Code field to the right, just below the Order Detail section. Enter the gift code and click Apply to update your order total. No. Proper Cloth gift certificates do not expire. Can I redeem a gift certificate in-person at the Proper Cloth showroom? Absolutely. We recommend scheduling an appointment to meet with one of our fit specialists. 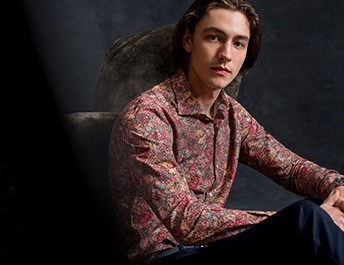 In person, we can help you (or the gift recipient) create a custom shirt size and learn more about fabrics and style options. Can gift certificates be applied to accessories and products other than custom shirts? Yes. Gift certificates can be applied to any Proper Cloth custom or standard size product. Can I apply multiple gift certificates to a single order? Yes. Please contact our Support Team to request that your gift certificates be combined or converted to store credit. What happens if a gift certificate is purchased with a fraudulent credit card? If it is determined that a gift certificate was purchased using a fraudulent credit card, or through other unlawful means, Proper Cloth reserves the right to cancel that gift certificate, cancel any order that was placed using that gift certificate, and remove any store credit that may have been added to an account related to the use of that gift certificate. Due to a recent increase in fraudulent activity, we would strongly discourage any customer from purchasing a gift certificate from any site other than www.propercloth.com.